Ann - "Many thanks to James and his crew..Fantastic job done by lovely polite, hard working people who clean up after themselves. Recommend them highly and will be having them back for any electrical job I need doing." Steve - "After loosing all power last night, Foleys turned up first thing this morning and Steve sorted the problem straight away. Highly recommend." Fiona - "I cannot recommend JFoley Electrical highly enough! 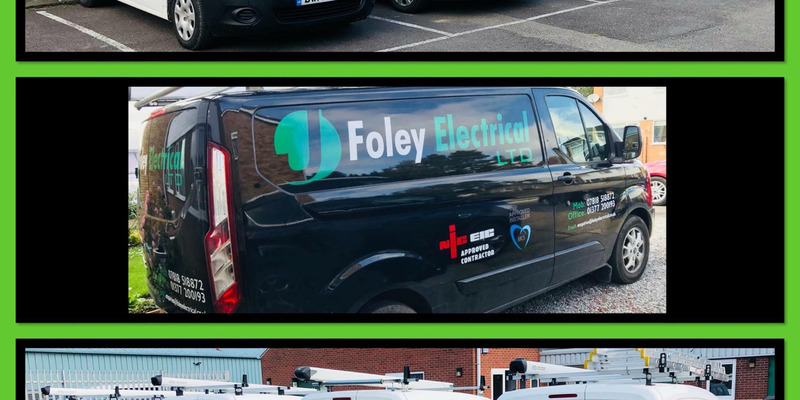 James and Sally always provide the most exceptional customer care but today I had the pleasure of meeting Steve, who works for J.Foley Electrical Ltd. Steve carried out various electrical tasks at our home and he was polite, friendly and courteous. He worked in a tidy and methodical manner. I cannot recommend Steve and this company highly enough!" Carol - "I cannot recommend J Foley Electrical highly enough! The always provide the most exceptional customer care and have carried out various electrical tasks at my home and the staff are polite, friendly and courteous. They work in a tidy way and are always happy to make sure it all works before they leave. Go the extra mile. Great to use a local company too."